The Institute of the Electric Crinolines is housed in a small tent at the crossing of the art / life divide and carries out investigations into art, poetics, life, concepts, noise and sometimes pop. 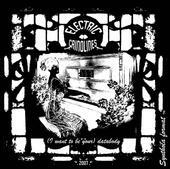 Among other projects the Electric Crinolines offered their first single in the nearly indestructible format of a MIDI file and almost played live. Visit us here.